Abbas' response to recent stabbings is not minor at all. It's the crux of the problem. The two “minor” stabbing incidents in Israel this past weekend shed light on many of the frightening phenomena that Israelis face each day--the horrors of terrorism, the hypocrisy of the international news media, and the dangers inherent in the advice that peace activists and the Obama administration are constantly pressing Israel to accept. At an Israeli Army checkpoint on heavily-traveled Route 443, between Petach Tikva and Jerusalem, a Palestinian Arab terrorist named Nasim Gomhur asked an Israeli soldier for some water. When the soldier turned around to get some, the Arab stabbed him in the back. The attacker was shot and wounded. If the soldier had refused to give him the water, and a journalist happened to be in the vicinity, one can imagine the next day's headline: "Despite Sweltering Summer Heat, Israeli Soldier Refuses to Give Water to Parched Palestinian." The real headline, of course, should be “Israeli Soldier's Humanitarian Gesture Rewarded with a Knife to the Back." But there won't be any headline outside of Israel, none of the major news media will even report the story. News that makes Palestinians look bad is not considered fit to print. By the way, the stabber, Nasim Gomhur is now in an Israeli hospital, receiving life-saving medical treatment free of charge, courtesy of the Israeli taxpayer. What would happen if Israeli hospitals declined to give free treatment to wounded murderers and attempted murderers? They would be taken to the Palestinian Authority's hospitals, where the treatment would be inferior, because the PA prefers to spend its money on guns for gigantic security forces and luxury villas for its cabinet ministers. I am not sure what Jewish or Israeli principle requires giving free medical treatment to Palestinian terrorists. 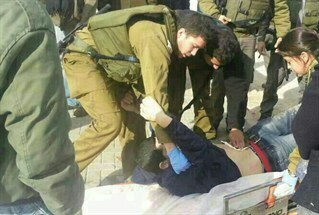 Perhaps it's just fear of headlines like "Israeli Hospital Refuses to Treat Palestinian Wounded in Clash." Why the supposedly "anti-terrorist" PA would want terrorists to be set free is one of those little contradictions that is never explained. Gomhur is technically not a murderer, he will be high on the list of those to be considered for release. Meanwhile, at another checkpoint that same day, a Palestinian terrorist named Rafiq Kamel Rafiq stabbed and wounded an Israeli soldier. Other soldiers then shot Rafiq dead. Israel's "Palestinian peace partner," PA chairman Mahmoud Abbas, responded swiftly. Since the Jewish left and the State Department always insist that Abbas is a great moderate, one might think Abbas quickly condemned the stabbings. The shooting of Rafiq, he said, was "a crime" and a "grave escalation." Not a word about the stabbing. Just this: "The crime was a continuation of the daily killing which no one can be silent at." Abbas's outrageous statement was published by the PA's official news agency, WAFA. For the Jewish left (in both Israel and the United States) and the Obama administration, the two stabbings posed about a dozen different problems. Here are just a few. ---The checkpoints. Obama and the Jewish left have been demanding for years that the checkpoints be dismantled--and, in fact, Israel has removed the majority of them in response to that pressure. If the two checkpoints at which this weekend's attack took place were not there, these armed terrorists would have entered Jerusalem or Tel Aviv undetected. ---The water gesture. Every time Israel even hints at reducing its humanitarian gestures to the Palestinians --such as electricity to the PA areas, even though the PA routinely refuses to pay the bill-- the Jewish left and the Obama administration shriek in protest. They insist that humanitarian gestures will be rewarded with Palestinian moderation. Instead they are once again rewarded with knives. ---Abbas. Every demand by the Obama administration and the Jewish left for more Israeli concessions is predicated on their claim that Abbas is a moderate who wants peace and opposes terrorism. So what can they do when Abbas's response to terrorism is to defend the terrorists and condemn Israel? All they can do is pray that nobody will ask them about it. That's their only hope -- that nobody will bring it up attomorrow's White House Press Briefing with spokesman Josh Earnest; that nobody will call the Peace Now office in Jerusalem or the J Street office in Washington and ask for their response. And to judge by the way things usually go in this world, that's probably not a bad strategy. Dishonest? Disingenuous? Dangerous to Israel? All of the above. But once a few hours have passed and the next news cycle begins, they are home free--at least until the next stabbing. 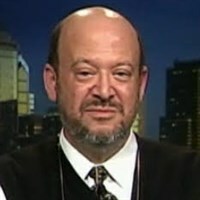 The writer, former executive editor of the Philadelphia Jewish Exponent and the Miami Jewish Tribune, is chairman of the Philadelphia Religious Zionists.